Need help deciphering what an LPN, ADN or BSN means in terms of nursing educational paths? The US credentialing letters can scare students away, making a nursing degree seem foreign and daunting. We have broken down the various nursing programs to provide you with a clear understand of each nursing path. Choosing to study nursing in the USA will give you the opportunity to study in state-of-the-art clinical facilities and train under the guidance of leading lecturers in the field. As an international student nurse, you will train in acute care hospitals, hospice care centers and outreach clinics. Studying in the US, you will have the opportunity to learn from experts, and be surrounded by students and professionals from various cultural, ethnic, religious, socioeconomic, and educational backgrounds. There are a wide variety of nursing courses in the different educational institutions across all the states in the US, providing students with the opportunity to choose the place and path that’s right for them. The vast array of nursing options may seem overwhelming, but once you understand the different programs you can start to explore the courses available in your chosen universities. The Licensed Practical Nurse (LPN) and Licensed Vocational Nurse (LVN) training programs are approximately one year long. An LPN/LVN works under the direction of a registered nurse. LPN/LVN programs are offered at many colleges throughout the United States. These programs do not typically require prerequisite classes. However, some schools do require a minimum TOEFL, SAT or ACT test score. A LVN/LPN nurse provides basic patient care, such as taking vital signs and patient monitoring. The state requires an LPN to pass a national licensing exam for state certification following training completion. According to the US Department of Labor Statistics, the median annual wage of licensed practical and licensed vocational nurse is $39,030 US. The Associate Degree in Nursing (ADN) training program can take between 15 months and two years to complete. This program is offered at many community colleges throughout the United States. ADN programs usually require students to complete pre-requisite classes prior to enrollment. This associate degree program focuses on technical training. An ADN registered nurse can treat, educate patients, and provide emotional support to patients' family members. ADN programs are only available in the United States and enrollment for international students is available. Associate Degree Nurses must pass a national licensing examination, known as the National Council Licensure Examination, or NCLEX-RN, to obtain a nursing license. According to the US Department of Labor Statistics, the median annual wage of ADN registered nurses is $67,490 US. The Bachelor of Science in Nursing (BSN) is a four-year program offered at many colleges and universities throughout the United States. One example is Felician College, New York State, where nurses are encouraged to use knowledge from their studies in a practical healthcare setting. Some programs conclude with a Clinical Residency to support the transition from trainee to nurse. The BSN program is popular among international students because it offers strong job prospects and a good salary upon completion. The demand for BSNs is high as the current generation retires, meaning there are lots of job opportunities across the US. 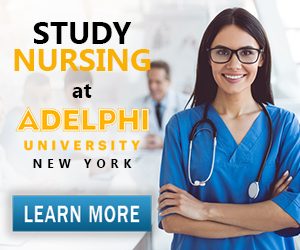 Adelphi University offers an Accelerated Bachelor of Science in Nursing program that enables students with a bachelor’s degree to obtain a BS in nursing in only 14 months. The program is for assiduous students who are capable of keeping up with fast paced teaching from highly regarded professors. The students will learn from a combination of lectures, research, and clinical studies. The program requires full attentiveness and a complete devotion to learning. It is so immersive that Adelphi advises participants to not work or have any potential preoccupations during the time of the course. However, it is more than worthwhile, as you can become a practicing nurse in just over a year. Felician University also offers a full-time accelerated nursing program which takes 18 months to complete. A Bachelor of Science Degree in Nursing is awarded upon completion and at the same time prepares international student to take the NCLEX-RN exam. These programs are designed for the ADNs who want to convert their studies to a Bachelor of Science (BSN) qualification. Programs are available both on campus and online. RN to BSN online programs are a popular choice among students who want to keep learning while working. he Master of Science Nursing programs (MSN) incorporate a variety of advanced nursing disciplines into a single course. There are several work opportunities available for graduates including: Adult Nurse Practitioner (ANP), Family Nurse Practitioner (FNP), Neonatal Nurse Practitioner (NNP), Nurse Educator (NE), Pediatric Nurse Practitioner (PNP), Women's Health Nurse Practitioner (WHNP). The median salary for those holding a MSN degree in the US is around $60,000-150,000 US depending on the specialty. The Certified Registered Nurse Anesthetist program (CRNA) typically lasts from 1 to 2 years. CRNA students learn anesthesia techniques, test theory, and how to apply knowledge to clinical problems. A nurse with a CRNA specialization can find some of the highest paying nursing jobs in the US, with many earning around $160,000-250,000 US a year depending on the state. Many MSN programs are being phased-out and are being replaced by Doctor of Nursing Practice (DNP) programs. These DNP programs primarily focus on training students in research methods including, statistics and data analysis, history and philosophy of nursing science, and leadership skills. Most DNP programs require 25 credit hours more than an MSN, and typically last between 18 and 30 months. Many DNP graduates go on to earn over $135,830 US a year. While the many different options for studying a degree in Nursing in the US may seem overwhelming, it means that each student can choose the course that’s right for them. Some students want to gain practical experience as quickly as possible, whereas others want to focus on their education and seek a high-level job when they graduate. Think about your priorities before exploring the different courses available in the many institutions across the US. Learn more about studying nursing in the USA by reading our growing article collection. « Study Guide by Subject	« Study Nursing in the U.S.